Hyper-V R2 brings some powerful virtualization to the table for those of us who do not have either the skills or the desire to work with virtual machineware. Most fans of Hyper-V are also likely to be well versed in Windows and may often lack the knowledge to rummage through Linux. Although there are many resources available regarding Linux on Hyper-V, I felt that most assumed the reader had intimate knowledge with Linux, which is often not the case. 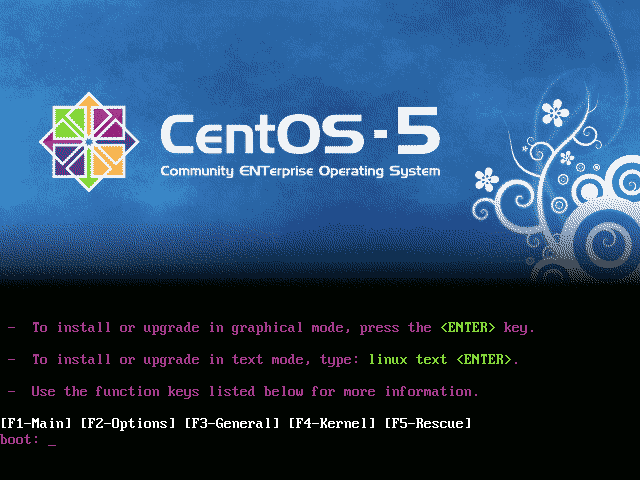 For Windows administrators new to Linux who wish to provide virtualized services to their end-users, my recommendation is to stick to CentOS 5.5. Being a close derivative of Red Hat Enterprise Linux (RHEL), the officially supported distribution by Microsoft, installation of the Integration Components is simplified and stability is matched to what is found when running RHEL. 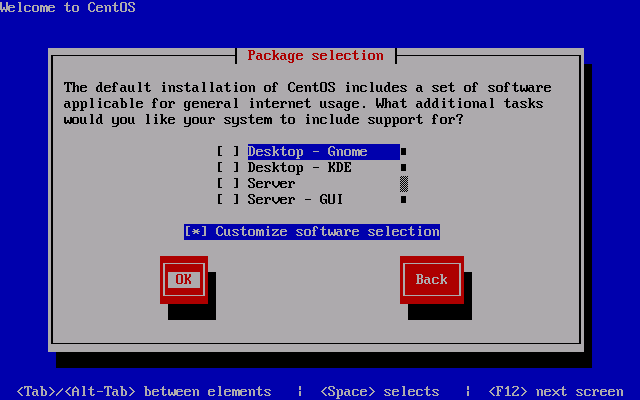 You will need the CentOS 5.5 x64 installation DVD ISO (CentOS-5.5-x86_64-bin-DVD-1of2.iso) which can be found at http://isoredirect.centos.org/centos/5/isos/x86_64/. You will also need the Linux Integration Services 2.1 ISO (LinuxIC v21.iso) available through the Microsoft Download Center at http://www.microsoft.com/downloads/en/details.aspx?FamilyID=eee39325-898b-4522-9b4c-f4b5b9b64551. To create the initial virtual machine, you will need to use the Legacy Network Adapter and limit yourself to a single CPU. You will also want to take time to decide how large of a VHD to allocate ahead of time as expanding a Linux partition can be a little complicated. Personally, I find 20GB to be sufficient for small, single purpose Linux virtual machines. 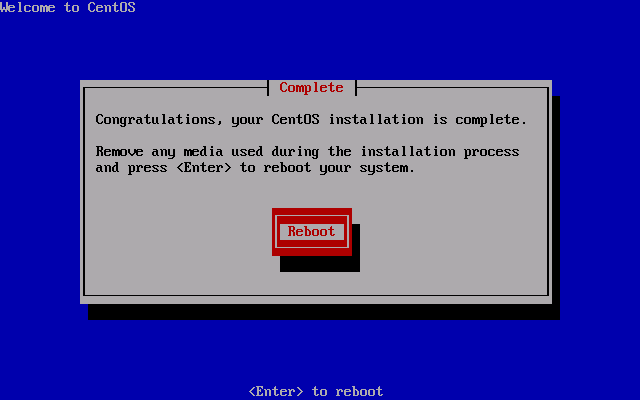 After booting from the CentOS ISO, you are presented with the choice to do a graphical or a text mode installation. To choose the text mode installation (as used here), simply type “linux text” at the boot: prompt and hit enter. 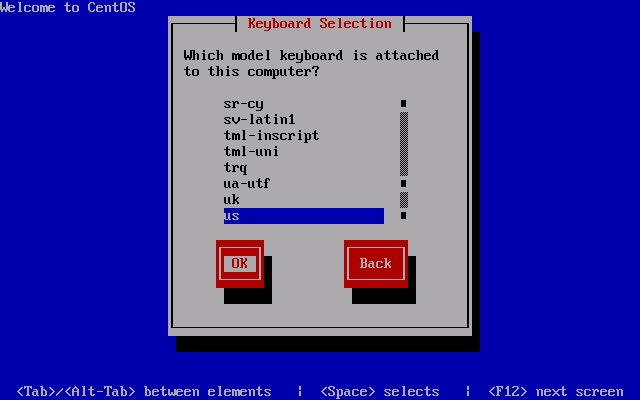 To navigate throughout the next portion of the text mode installation, use the Tab key to navigate between fields and the Space key to select options or hit buttons. You will be asked if you would like to do a media test. You can safely skip this. 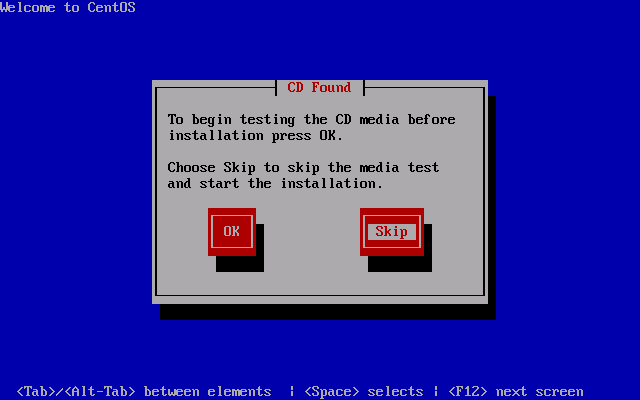 The initial welcome screen to the installation process. 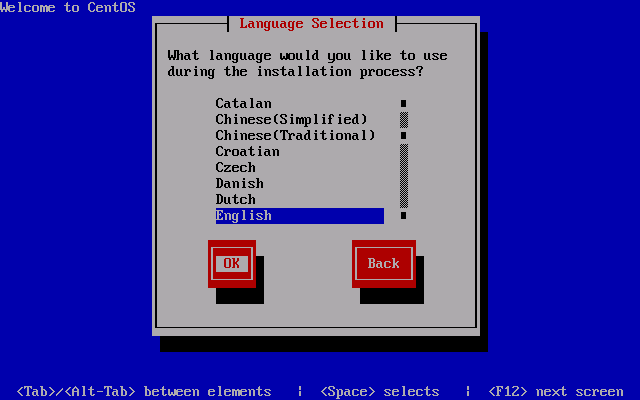 Choose your language as appropriate. 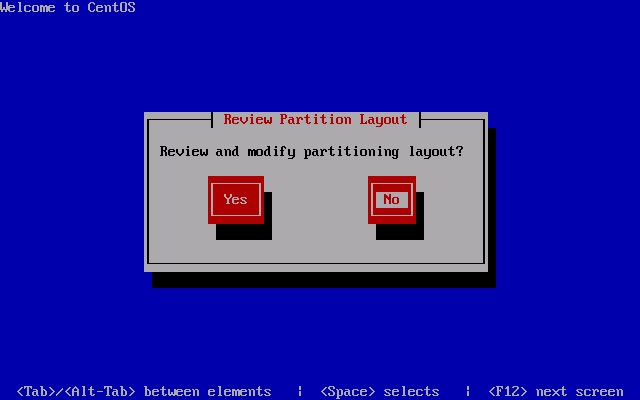 You must then partition your VHD for Linux. As you will be starting off with a fresh VHD, you can simply choose “Use free space on selected drives and create default layout.” and continue with OK.
Be sure to hit No to continue as hitting Yes will simply bring you back to the previous screen. As long as you have properly configured your virtual machine to use the Legacy Network Adapter, you will be presented with the opportunity to have the installation configure it for you. 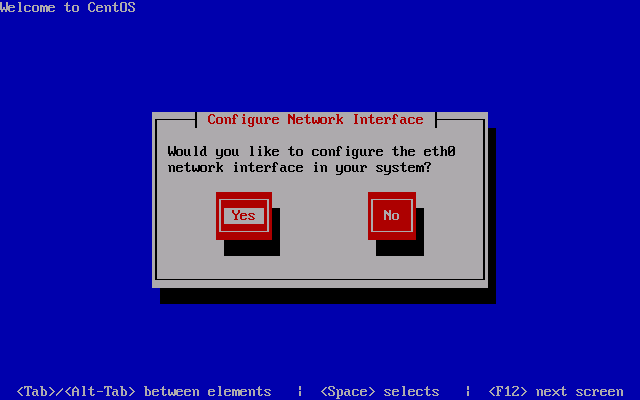 Check the “Enable IPv4 support” option and hit OK to continue. 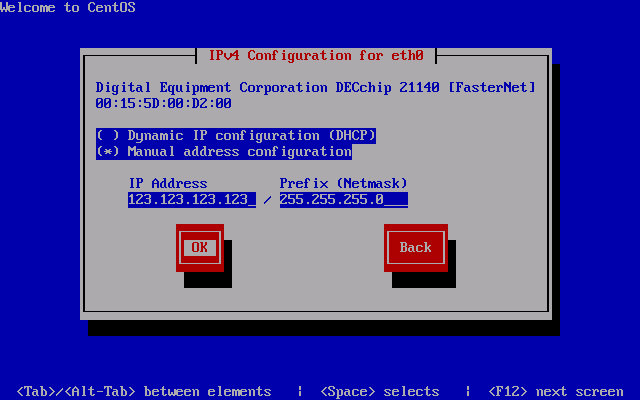 Switch to the “Manual address configuration” option and enter your IP address and netmask as appropriate. 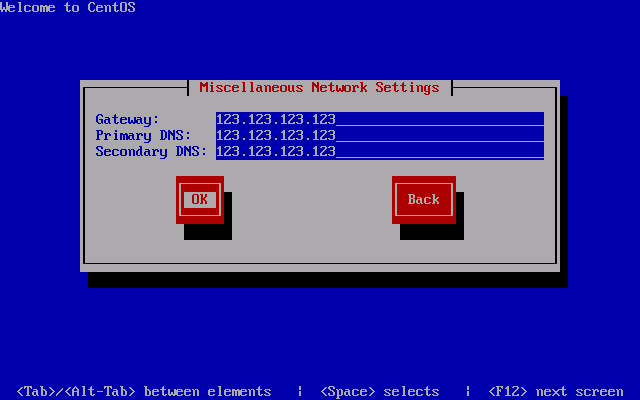 Continue on by entering your default gateway (usually your router or your network’s default route). If you have internal DNS servers for your network, enter them here or alternatively, you can use OpenDNS. 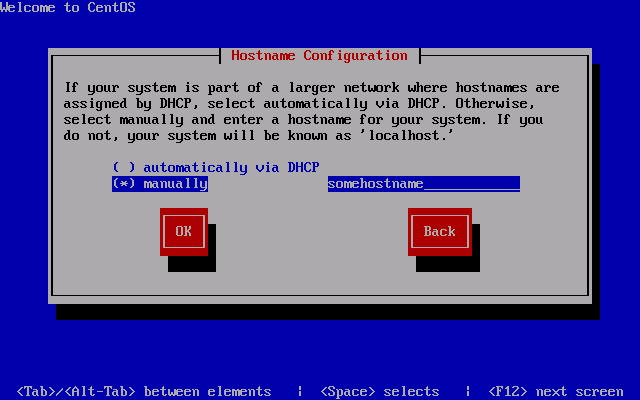 The name of your virtual machine is defined here as the hostname. 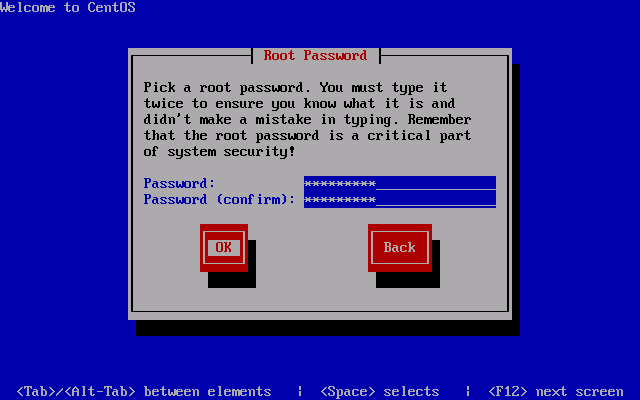 Be sure to choose a secure root password as the root user has complete access to the entire virtual machine and SSH is enabled on first boot. 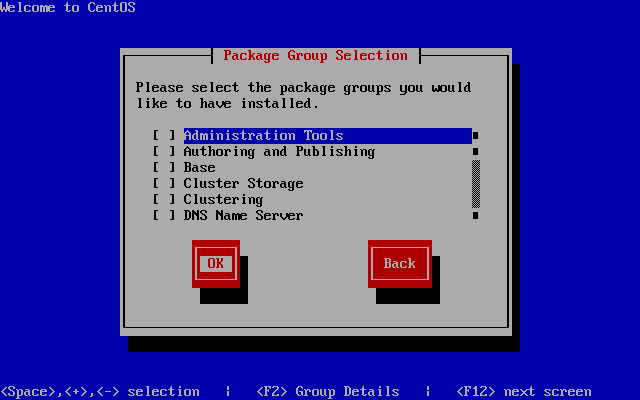 For a bare minimum installation, uncheck all of the packages, check “Customize software selection” and hit OK.
Uncheck all package groups and continue. Anything you require can later be installed by yum anyway. Installation will begin once you continue past this screen. 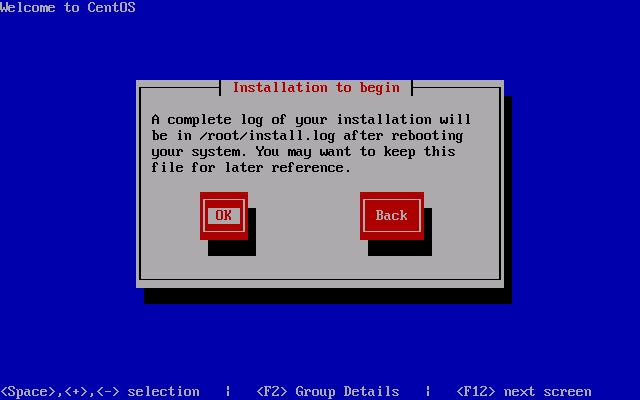 Once installation is complete, you will be required to reboot. After rebooting, you will be ready to login. At this point, I recommend connecting via SSH in order to copy and paste commands. The first thing that must be done is to update all the base packages and upgrade the kernel to the latest version. Simply run a “yum update”, then reboot. You will need to install the required “kernel-devel”, “gcc”, “make” and “perl” packages to compile and install the Linux Integration Components. Also, I suggest installing the VIM text editor. Attach the Linux Integration Services ISO. Once attached, you will need to mount the cdrom. You must then copy and compile the source in a temporary folder. Finally, you will be able install the Linux Integration Components. “make” will compile the source, then “make install” will install the compiled drivers. The time synchronisation component is not compatible with CentOS, therefore you will need to install “adjtimex”. You will need to shutdown the virtual machine in order to enable the Synthetic Network Adapter and increase the number of CPUs allocated. To do so, run the shutdown command. 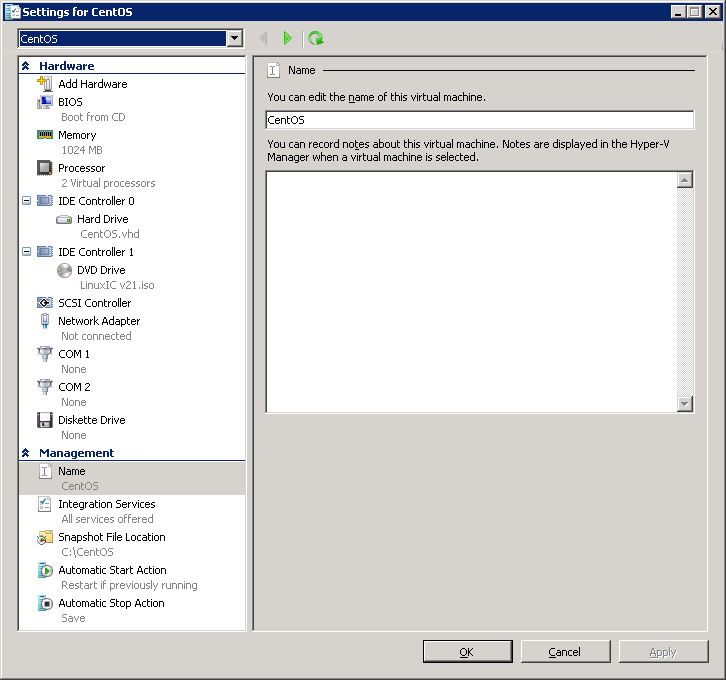 Change the settings in Hyper-V once the virtual machine has completely shutdown. Start the virtual machine and log in. You will need to reconfigure the network adapter as “eth0” will have disapeared and a new adapter, “seth0”, will have taken its place. The easiest way to do this is to edit the MAC address in the “eth0” backup file to match the MAC address of the Network Adapter as displayed in the virtual machine settings in Hyper-V, then copy the backup file as “seth0” and restart the network service. Don’t forget to also update the DEVICE line use “seth0”. 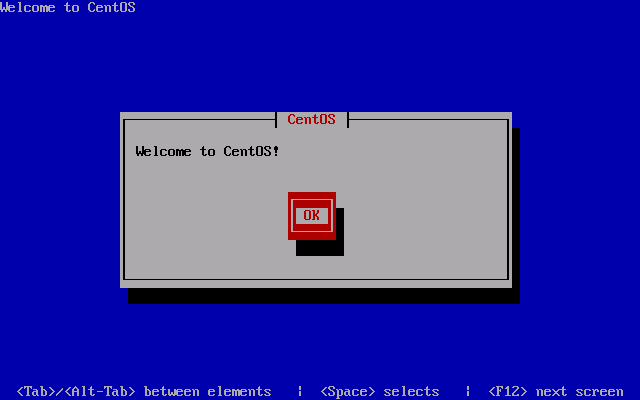 If all went well, you will find yourself with a bare minimum install of CentOS 5.5 running the latest kernel and version 2.1 of the Linux Integration Services. Fully virtualized and synthetic. You can now enjoy the many benefits of Hyper-V Linux such as the ability to shutdown the virtual machine without the root password. This is great. You can’t say how much I appreciated this. With MS Linux Integration Component on CentOS or possibly other releases of OSes, the Mouse driver still seems to be a problem. Did you try this Vinod? I can ping all my network but nothing outside…like for http://www.google.fr it says : unknown host. Please, help. What is wrong ? Sounds like you don’t have your nameservers properly setup for DNS lookups. How can i change it ? What should it be ? thank you for your help. You were right, it was the dns. I can update the system now ! 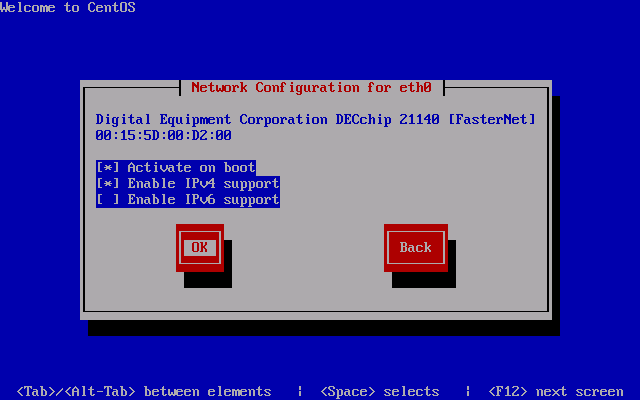 Now that everything is installed, i don’t understand why the /etc/sysconfig/network-scripts/ifcfg-eth0.bak file is empty ?! Thnak you for your help. This is great, thanks! I’ve used Linux with Xen but I am new to Hyper-V so this was very helpful. Hey this was helpful article,thanks. I got stuck on the make step, a minor kernel update came out. and the make install may fail unless you’re running in ‘su -‘ instead of su, because depmod needs root I think. I just wanted to say thanks for a great post – very easy to follow.